A model made based on the latest paleontological notions of what dinosaurs were like- this one is now believed to have been feathered! Over the past few decades exciting new fossil discoveries, more sophosticated technologies, and a slew of talented researchers have all combined to lead to a complete revision of the traditional view of what dinosaurs were really like. Much more active and fast moving than previously imagined AND many covered with featherlike fur, this new image of the TERRIBLE LIZARDS ( the Latin etymology of the word dinosaur ) comes as a complete shock to someone like me who way back when spent his childhood with his nose in his dinosaur books -whose illustrations depicted sluggish, leather-skinned creatures ( a feeling of being passed over by time similar the one I felt when I found out that Pluto was no longer considered a planet!) . And of course the number of newly recognized species is overwhelming. When I was a kid, we knew T-Rex, brontosaurus, stegasaurus, triceratops, diplodocus and a few others. Now there seem to be hundreds of newly established names in the dinosaur kingdom. The world of paleontology has indeed gone through a revolution. But despite all the changes, one thing has remained the same- most kids still seem to be truly fascinated by the extinct creaures-and many of their parents are as well ( and not only for nostalgic reason). Maybe it is something deeply ingrained into our biology- a genetic memory going back millions of years to a time when the creatures which were our ancestors roamed the earth. This fascination showed itself in the days before it was understood what dinosaurs really were, in the days when the discovery of strange and often giant bones lead to the creation of stories of the existence of beasts which we now call mythical- dragons, griffins, and a whole bestiary of imaginary beasts ( with the most having been spawned in the land in which most fossils are found now- China). and a good place for adults to get an update on all the new ideas in paleontology ( and a look at some of the newly identified species). 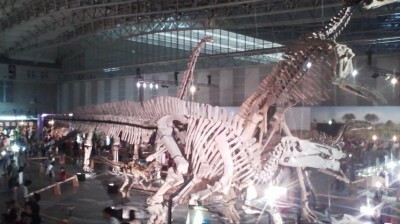 For adults truly interested in dinosaurs, the display of greatest interest is surely that of the 125 million year old Yutyrannus huali bones, which are seen as evidence for the feather theory (kids,however, will probably take no notice of these fossils among all the other distractions). This is the first time that they have been shown outside of China, where they were discovered. 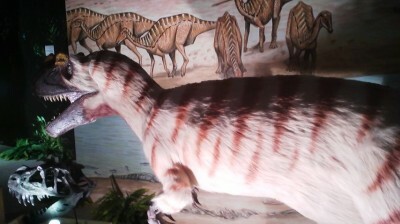 There are some models of dinosaurs showing based on the latest findings and theories and dozens of newly dinosaurs ( mostly found in China) which you most probably have never seen or heard of before. 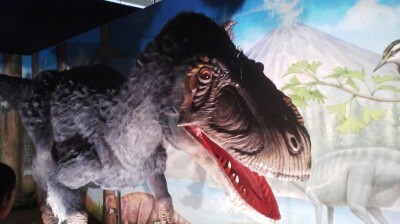 And even if you CAN read Japanese (like me), if you have your kids with you (like me), you will not have the leisure of reading much of anything- you will be trying to keep an eye on the very excited little ones as they run ( in the very crowded halls) for one dinosaur to the next. The kids can also enjoy a few inter-active attractions: craft-making, digging for fossils, etc…. and there are plenty of great places to take photos. One thing which made my visit a downer, however, was that at the end of the exhibition was a huge gift shop- which all the children seem to find the most attractive part of the day. They cant understand the fact that everything on sale their is terribly over-priced and are liely (like mine) to throw tantrums if they dont get the dinosaur motifed goods (and there is an amazing variety of them) that they want. Just take TX to Minami Nagareyama and then change to the Musashino Line at the JR station. Change again in Minami Funabashi to the Keiyo Line and get out on stop later at the Kaihin Makuhari Station. From there it is a ten minute walk to the venue. It costs a hefty 2500 yen for adults to enter and 1200 Yen for elementary and junior high school students. Amazing! Kids know their names!! For me GODIRA was so awful in movies 60years ago. Then Director Mr.Tsuburaya was a genius. I am afraid my underwear would be wet if I visit Makuhari-exhibition? !